Repetitive motion injuries are occurring in younger and younger athletes as many kids specialize in a sport earlier than they have in the past. In addition, competition at a younger age has intensified. So how can we help young athletes stay healthy and enjoy a long career in their sports of choice? A wonderful tool that is often overlooked is yoga. Why is yoga good for young athletes? A regular yoga practice helps prevent injuries and speeds recovery from strenuous workouts. Yoga helps with breathing, flexibility, strength, confidence, energy, balance, concentration, endurance and injury prevention. Yoga also helps young athletes learn how their bodies work. Proper yoga instruction teaches body mechanics and enhances body awareness. Yoga teaches players how to harness their breathing and focus on the present. Being able to visualize the next shot in basketball or hit in football can help improve their game. Yoga teaches players how to slow down, regenerate from their strenuous workouts and relax. With the intense pressure to do well in school and sports, most kids don't take the time to reap the benefits of their hard work. There are several yoga poses that can help youth athletes. How to do it: Come to the floor on your hands and knees. Push with your hands and straighten your legs until you are in the shape of an inverted 'V.' Extend your pelvic bones up and heels down. Let your head hang freely, unstressed, stretching your waist. Heels may be off the floor but are actively trying to reach the floor. Why it's good: Elongates the shoulders. Stretches and strengthens the hands, wrists, low back, hamstrings, calves and Achilles tendon, all of which are essential for any sport. How to do it: Start on your hands and knees. Step your right foot between your hands into a lunge, keeping your right knee directly above your heel. Slowly lift your back knee off the floor. Press your back heel toward the wall behind you as you begin to straighten the back leg. Keep your spine long as you hold and breathe. Why it's good: Strengthens the quadriceps and glutes. Stretches the psoas and hips. Targets all areas that basketball and soccer players use constantly while running up and down the court or field. 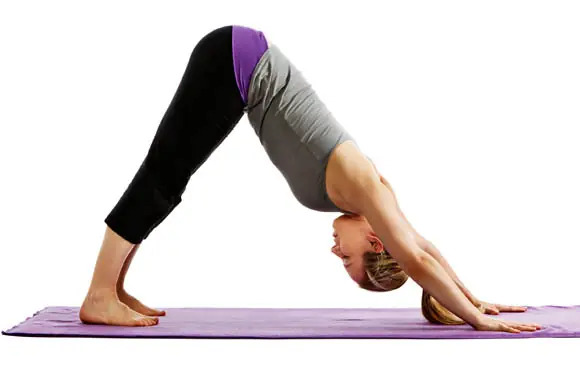 How to do it: From crescent lunge, bring your hands into prayer position and then slowly twist the spine to one side, hooking the elbow outside of the knee. (If the right knee is forward, twist to the right.) Stack the shoulders on top of each other, keep the heart open and gaze up toward the sky. Why it's good: Lengthens and stretches the spine. Creates flexibility in the rib cage, which can aid in throwing movements in football and baseball. How to do it: Stand with your feet together, your big toes touching. Raise your arms above your head, perpendicular to the floor as you bring your thighs parallel to the floor as if you are sitting in a chair. Why it's good: Strengthens the ankles, thighs, calves and spine. Stretches shoulders and chest. This is a great pose for football linemen who are constantly in a three-point stance or catchers having to crouch behind home plate. How to do it: Lie on your back and extend your left leg toward the ceiling with your right leg extended along the floor. Flex both feet. Bend your left knee and bring the knee in toward your chest using your hands. Hug it tightly against your body to relax your hip. Next, loop a strap around your left foot and slowly straighten the left leg back to 90 degrees in relation to your body. Press your right thigh firmly planted against the floor; you can hold your right hand there to keep the hip down. Why it's good: Stretches hips, thighs, hamstrings, groins and calves. Strengthens the knees. Good for all sports that involve running. How to do it: Lie on your back, bend your knees, and place your feet flat on the floor hip-width apart. You should be able to touch the backs of your heels with your hands. Place your arms on the floor alongside your body, palms down, and as you inhale, lift your hips off the floor and press them to the ceiling. Keep your knees directly over your heels. Hold. Why it's good: Bridge strengthens the back and develops the muscles that surround the spine. It is also a powerful move to strength the glutes, hips and hamstrings which are essential for running in football, soccer and basketball. How to do it: Start by getting into a push-up position. Bend your elbows and rest your weight on your forearms, not on your hands. Your body should form a straight line from shoulders to ankles. Engage your core by sucking your belly button into your spine. Hold this position for 20 to 60 seconds. Why it's good: Strengthens wrists and hands--good for catching the ball in football and baseball. Strengthens the entire core, which includes abdominals, hips and low back--essentials for all sports.